This week's Intuitive Tuesday card was the King of Swords, a card that indicates a strong, intellectual influence in your life -- possibly a person, you, or a situation you are facing. From Tuesday's comments, it seems each of the readers had a definite intuitive hit as to what or who this card was referring to. This seems an easy call for me as far as how to interpret the King of Swords. I've really stalled out on my job search lately and have been trying to get myself going again. Fuzzy feelings is a great way to describe my lack of energy regarding continuing the search; feeling discouraged, hopeless, like it's all for naught so why bother, etc. I certainly need to cultivate more of the King's qualities to spur me on down this path I must travel til I reach destination: Full employment". Pulling the Knight from the same suit (swords) as Intuitive Tuesday's King of Swords emphasizes the need for rational thought to help you through this situation. In fact, in each of the reader's comments, there was a theme of not leading with the emotions and putting more thought towards the decisions and situations being faced. I see a difference in "feelings" vs. intuition. When I am referring to feelings, I am referring to your emotions. Intuition refers to the inner voice inside of you that knows. It's your gut feel. And sometimes it's hard to tell the difference because our feelings/emotions are so strong that they seem to permeate the entire decision-making process. This is where your Ring of Truth (being able to recognize your intuitive voice) comes in extremely handy. If you need a reminder on how to do the Ring of Truth exercise, email me and I'll send it to you. Knights herald changes in your life. There is an energy and a restlessness that goes with this pending change. The suit of the knight determines where and how this change will come into your life. Just as you think of a knight in a suit of armor, knights can also call upon your strength and courage to take you through your next "battle." That's OK. You 'e ready for it! 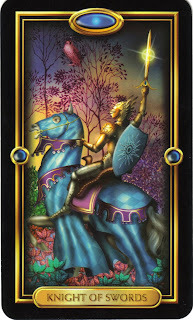 Knowing that swords indicate thoughts and conflicts, the Knight of Swords would mean an important event related to your thoughts and possibly conflict that may soon enter your life. Calling upon your Knight of Swords qualities, your situation calls for swift thought and quick thinking...based on your experience, knowledge and intuitive guidance (yes, intuition even in the realm of swords can help you to sift through the thoughts running through your mind). 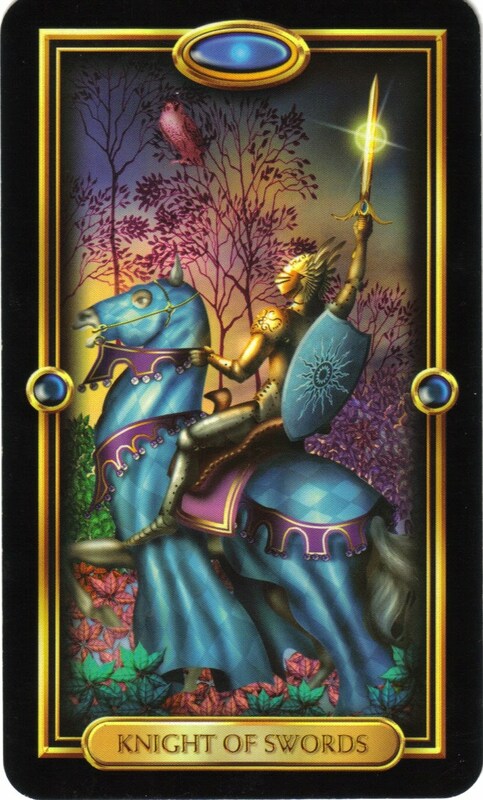 Ailey, in regards to your job search, the Knight of Swords would indicate that it is time to jump back on your horse. Brainstorm new ways to reach potential employers, revisit avenues that you have already explored (if you think there may be a possibility of re-opening possibilities), and use your mind to come up with new ways to solve your problem. Have you ever played with or tried to solve a Rubik's cube? It's as though in your job search you have been flipping the sides of the cube all around, trying to get all of the colors grouped together on their respective sides of the cube. As much as you play with it, you may get one side "solved" only to see that the rest of the cube is a colorful mess. This is where you can keep applying the same system of fidgeting with the cube...or get help by either asking someone who knows how to solve the problem or look it up on the Internet or get a book or watch a video of how to solve the Rubik's cube...OR peel off the stickers and put them on the correct sides (cheating??). You see? There are many ways to go about solving the Rubik's cube, but it may be futile to try to keep doing what you have been doing. It's the same in your job search. What other resources can you call in to help you make progress towards finding your full time job? The Knight of Swords asks you to use your powerful intellect and figure this out (even if it means not solving it all yourself). And for all of us who struggle with a similar question of how to solve our own situation or make our own decision...think about using the power of your intellect to come up with new ideas. Brainstorm. Ask for help. Get the courage to try something new. And if it helps, go out and buy a Rubik's cube and sit it on your desk to remind you to use your Knight of Swords qualities to move forward. "the Knight of Swords would indicate that it is time to jump back on your horse." I know exactly what this is referring to. And it's spot on, as usual! I really liked how you distinguish feelings from intuition. The knowing it very different from the feeling, once you know they are not necessarily the same. Sheri-Thanks for pulling a card for me. Yes I definitely get the difference between feelings/emotions and a feeling or intuition. And there is always room at the brainstorming table for intuition. I guess I've been talking to the wrong people as far as getting fresh perspectives go. No problem asking for help just some challenge involved in finding other people to brainstorm some fresh approaches with. And when it comes to new ideas, and following through on them, a dose of courage is always called for as well. Hmmm maybe it's time to start some sort of group on facebook to gather a group of people who are likewise ready and needing to think about and approach their jobsearch in a different and fresh way. Thanks again. Thank you for the reminder about the difference between feelings and intuition. That is exactly what I needed! "feelings" and "intuition" and what came to me was that I need to take better notice of when my feelings are intutive (my intution often speaks to me through my feelings) and when they are informative (I "feel" information). When I feel intuition, a get an emotional sensation about what is coming or what to do - that inner knowing voice is connected to it. When I feel information it brings to my awareness what is here now, then I use my intellect to interpret the feeling, and then I can tap in to my inner voice and/or intellect to decide what my next step is order to continue forward. That feels like a nice synthesis of my intuition and intellect. This card and your interpretation really helped me clarify this aspect of myself. Much gratitude Sheri!